Lander cited several factors contributing to a "broad housing crisis": a "broad shift from a manufacturing economy to a service economy," along with "substantial immigration leading to rising population," all pressuring a constrained housing supply. Over the last quarter-century, New York City has lost middle-class families but gained wealthy and poor families. 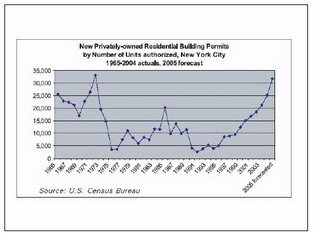 The city gained more than a million people since 1980 and may gain another million, so supply can’t keep up with demand. So land has been rezoned from manufacturing to residential—Lander cited the Williamsburg/Greenpoint waterfront and Atlantic Yards, though of course the latter was not a rezoning. 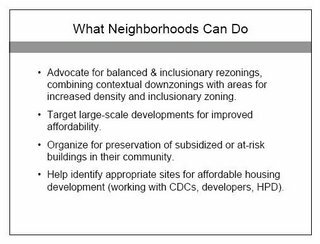 Meanwhile, some neighborhoods in Brooklyn and Queens have fought overdevelopment with downzoning, essentially freezing density. Where are the people going? “So, some set of people are being displaced," Lander noted. "An enormous set of people are paying much more of their income for rent, which obviously has all kinds of consequences. People are crowding much more–-that, actually we don’t have stats here, but the crowding stats are up dramatically. Or, some kind of public policy is mitigating their need to move…." 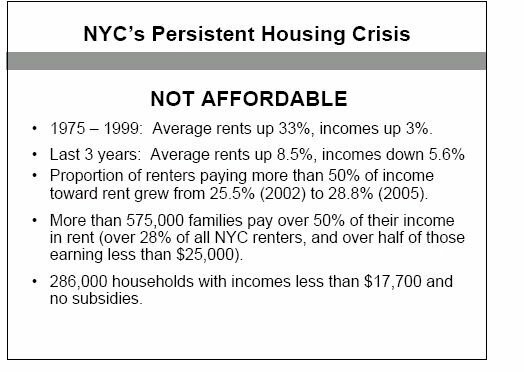 Lander suggested that the statistics provide "really good evidence that rent regulation in New York City enables people in gentrifying neighborhoods to stay in those places.” He also cited the presence of public housing or subsidized housing like buildings in the Mitchell-Lama program. 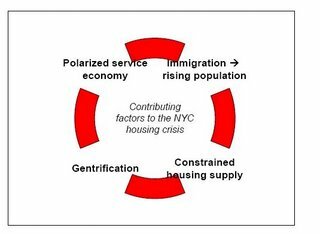 It's arguable that the Atlantic Yards Community Benefits Agreement brought more housing--or a better development--than might have been achieved via a more public rezoning. Indeed, Lander acknowledged there are tradeoffs between market forces, issues of equity, and issues of livability. During a February 2006 debate between Bertha Lewis of Atlantic Yards advocate ACORN and Candace Carponter of AY opponent Develop Don't Destroy Brooklyn, Lander observed that “equity advocates” accept more market-rate housing if it brings benefits, while “livability advocates” want less development because it inflicts less environmental harm. "It sets up a painful and challenging conflict," he mused. “Maybe other land use procedures--ones that put planning earlier and up front wouldn’t lead to this dynamic, but we wind up in it an awful lot of the time." Indeed, as Jerilyn Perine of the Citizens Housing and Planning Council has pointed out there's been a significant dropoff in federal subsidies. But there's more that the city could be doing, as critics from both the left and right argue, and I'll address that shortly. 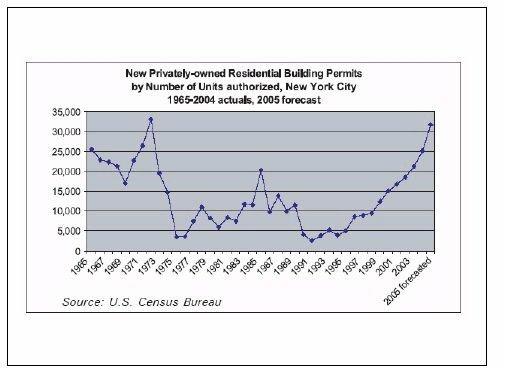 The housing squeeze is significant, as shown in the State of New York City's Housing and Neighborhoods 2005 report, issued in June 2006 by New York University’s Furman Center for Real Estate and Urban Policy. 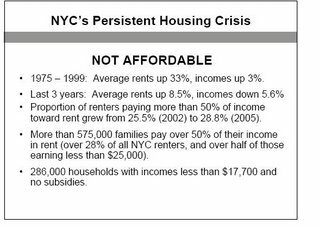 A 6/16/06 Times article headlined Housing Tighter for New Yorkers of Moderate Pay reported that the number of apartments affordable to some 40% of New Yorkers, households earning about $32,000 a year, or 80 percent of the city’s median household income, dropped by 205,000, or 17 percent between 2002 and 2005. The median rent for unsubsidized apartments went up 20 percent while household income declined. "The market will work through this, but there are people who really lose," said Chris Mayer, director of the Paul Milstein Center for Real Estate at the Columbia Business School. The article echoed some of the issues Lander raised as contributing to the rise in rents: a growing population that outstrips new construction; construction geared to higher-income households; and an influx of higher-income residents. The most recent Furman Center report, issued April 11, the State of New York City’s Housing and Neighborhoods 2006, showed that the median home sales price in New York City rose by 68 percent from 2000 to 2005, adjusting for inflation, but that fewer than 5 percent of home sales in 2005 were affordable to New Yorkers earning the City’s median income ($43,434). That’s a significant drop from 11 percent in 2000. The report painted a picture of a city deeply divided, but some press coverage focused on the positive news it included. In a 5/27/07 article headlined In a City Known for Its Renters, a Record Number Now Own Their Homes, the Times reported that one in three households now own their dwellings. Only well down in the article did the newspaper discuss the growing rate of foreclosures and the fact that only a tiny fraction of homes are affordable to average households. Lower in the article, the Times shifted gears and cited the Furman Center report, noting, “But unfortunately, not all New Yorkers can contribute to this high end of the real estate market.” Those New Yorkers, it's safe to say, are not looking for housing in the Sunday New York Times.